Unique Moments Photography of Gig Harbor Washington wants to have fun and be creative with our brides and grooms. Formal pictures are very important but we want to get the brides and grooms away and have some fun capturing images. This was an Oh man we gotta try something moment. We just got off the party bus and we were heading into a bar for some relaxed bridal part time.We saw this Blow up slide across the street at a birthday party and we casually said, man that would make a great shot if you two were sliding down that slide. Our bride laughed and said she was game. 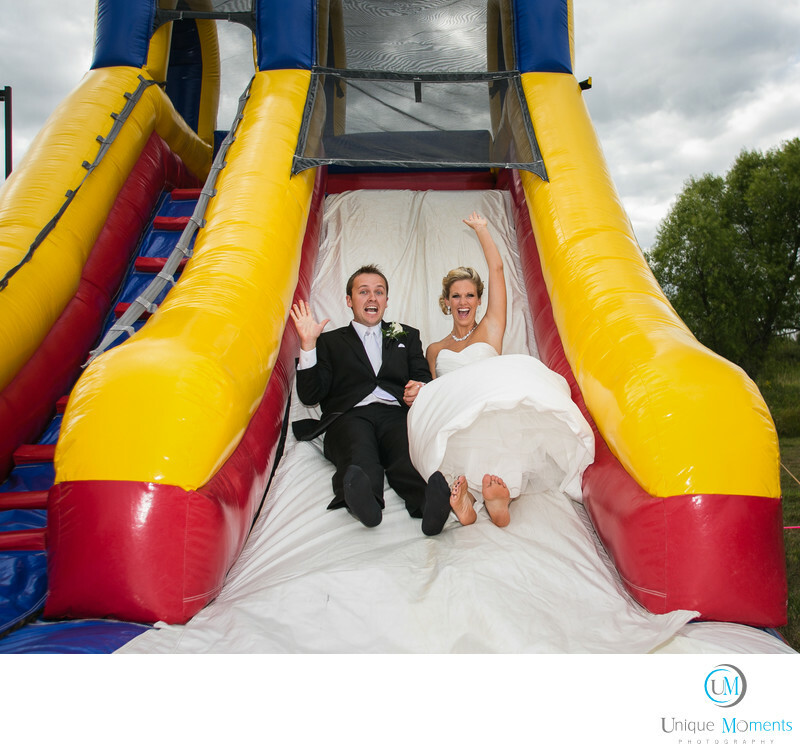 So We asked the family if the Bride and groom could slide down the slide. The rest is history. Such a fun and cute shot. Its 5 yrs old and definitely qualifies as a unique Moment. The clients loved the image and the picture is in their album. Be brave and daring and most of all, If your photographer starts getting excited about something fun to do, trust them and go with it. This has been a favorite for years. Location: William A. (Bill) Vanzee Memorial Park Port Orchard.